This Magnum Solenoid Fingerprint Safe provides quicker access and greater security to your safe's contents, it is solid steel and has concealed hinges that makes it pry resistant. 1 Hour Fire Rating exterior temp of 1700/ 927C and water Resistant Door & Cabinet Design with dual 4# Combination Dial and Key Lock Protection. Includes 2 Solid Steel Live Lock Bolts with Double Steel Wall Construction and Protective Rubber Feet for scuff resistance, Adjustable Shelf for versatility. Includes a 7 Yr. Warranty and a Lifetime After-Fire Guarantee. The HW Model #2116 Steel Security and Water Resistant Safes is rated for 1 hour Fire and Theft Protection Electronic security features include Dual Digital & Key Lock Protection, Control panel with LED Readout with Audible Motion & Tilt Alarm, Programmable Calendar & Clock and a retrievable user history log. Interior features include an Adjustable/Removable Shelf and a Locking Storage Drawer. Double Steel Wall Construction with 6 solid steel door bolts and heavy duty steel casters. Features include Programmable Dual-User Digital Lock with lever style door handle and 2 back up keys. Exterior finished in durable Powder Coat Finish for long lasting quality. Comes with the industry's longest Seven Year Warranty and Lifetime After-Fire Guarantee. 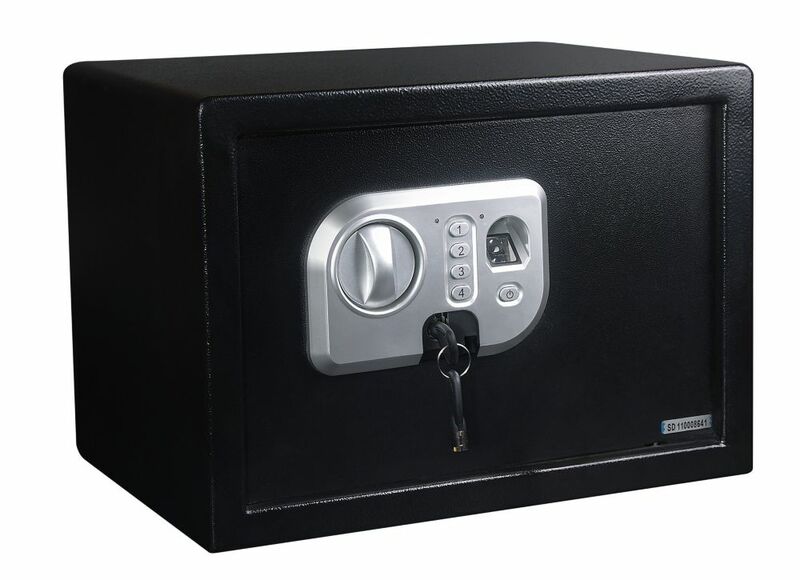 Magnum Solenoid Fingerprint Safe This Magnum Solenoid Fingerprint Safe provides quicker access and greater security to your safe's contents, it is solid steel and has concealed hinges that makes it pry resistant. Magnum Solenoid Fingerprint Safe is rated 3.7 out of 5 by 9. Rated 5 out of 5 by atch1988 from Value for money I already exact same model in Far East, and bot this for my elderly father. The fingerprint function is amazing because he does not need to remember the number code. I just leave the safety keys with a trusted relative and everything is good. Rated 4 out of 5 by Paul from finger print reader has worked every time so far. just... finger print reader has worked every time so far. just store your print from 3 slightly different angle and you won't have a problem. Strong enough safe for the price! Rated 5 out of 5 by HDCustomer1313 from This safe was super easy to set up and use. It easily took my finger print and my thumbprint, an... This safe was super easy to set up and use. It easily took my finger print and my thumbprint, and I have opened it several times without fail. It also has 2 keys that come with the unit in the case that a fingerprint would not work, or the batteries are dead. This safe also has a keypad for a numeric code. 3 ways to enter this safe which is a great feature. It comes with a shelf inside which is removable if you have a taller item. Lots of space inside for important documents, credit cards, valuables, jewelry, etc. I would recommend this product. I am happy with its performance. Rated 1 out of 5 by Paul from installation guide in box is not for yhe safe I received. It wont take fingerprints and looses it... installation guide in box is not for yhe safe I received. It wont take fingerprints and looses it brains for the code. Rated 5 out of 5 by Patcee from A great deal and easy to understand directions. The perfect size for home. A great deal and easy to understand directions. The perfect size for home. Rated 2 out of 5 by Chelsea from The door of the safe was thick and sturdy. The sides of the safe could be easily punctured. I ret... The door of the safe was thick and sturdy. The sides of the safe could be easily punctured. I returned the safe. Rated 4 out of 5 by Sunflower from It's roomy and easy to use and set up.... It's roomy and easy to use and set up. Rated 4 out of 5 by Mike from Great product, scanned several fingers from different angles and have not had any problems with o... Great product, scanned several fingers from different angles and have not had any problems with opening on first try. Only issue I have is that I cannot reset the original pin code so its basically useless. But still have the key as a backup.